Heavy-Duty Gear Head jackshaft operator. These operators are overstock and priced to move! 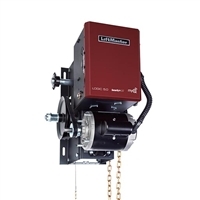 Hoist style commercial door operators are optimal for industrial applications. Gearhead Sliding (GSD) style commerical door operators employ lubricated gears for heavy industrial, high cycle applications.